The focus of this chapter (and the next) is the felt, everyday experiences young people have of specific travel modes and their journeys using them, drawing on Cresswell’s (2010) disaggregation of mobility into constituent parts, each with a politics which can be used to differentiate people and things into hierarchies of mobility. 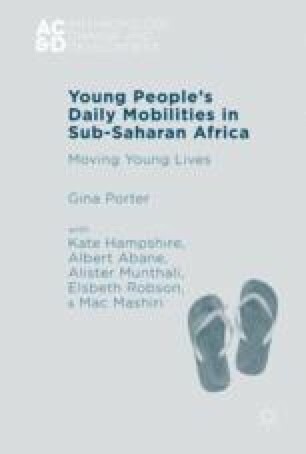 Following a brief comparative review of young people’s overall transport and travel practices across Ghana, Malawi and South Africa, based on survey data, the discussion draws intensively on ethnographic data to interrogate identified patterns of walking and cycling, contrasting travel practices in diverse rural and urban locations and exploring the implications of travel mode for lifestyle and identities. Gender and age-related differences are highlighted wherever relevant, leading to wider reflections concerning young people’s embodied practices of travel and transport experiences.